Stariel Knits | Not Socks! Hey look at that! That’s a hat, knit with less than a skein of Berroco Plush. It’s all plain ol’ stockinette and it doesn’t even roll at the bottom, which is why it’s folded up. And it’s for a very good cause! 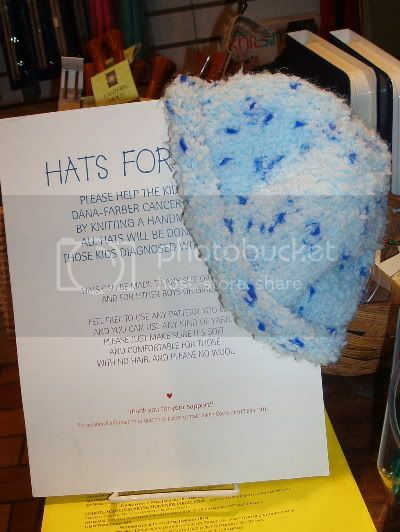 Dana Farber is collecting hats for kids with cancer – you can drop them off at A Good Yarn. I love that colour too – is it an optical illusion that the knitted part looks bluer than the rest, or is that part of the colourway? The yarn (Jojoland Melody from the last post) is somewhat similar to Trekking in its subtle variegated colors, so yes the knitted part was a bit more blue. What size needles are those? They look… tempting! Mine are size 1. I’m enjoying them, the decoration in the middle of the needles helps keep stitches on there securely while I’m using another needle, but the tips are smooth for easy stitch movement while I’m knitting. It looks as if socks will always rule the roost around here…and you said you would diversify this year!!! What?!? No socks? What’s going on here? PS – I’m so happy to see you’re designing – it’s about time!!! That hat looks very coz-y!